Intel's socket LGA2011 2nd Generation 'Sandy Bridge-E' processor overclocks a lot like the previous LGA1155 Sandy Bridge chips, meaning the -E processors don't react very well to overclocking strictly via motherboard BCLK adjustments. If you recall, the first generation Sandy Bridge (LGA1155) CPUs could stand the default 100MHz BCLK pushed as high as about 104.8MHz before the system became unhinged. 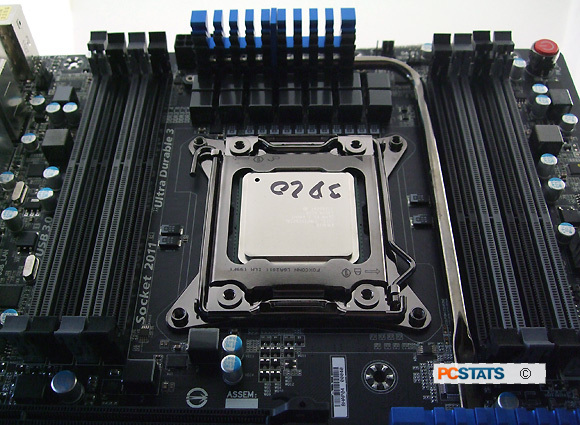 The new LGA2011 Intel Core i7 3820 Sandy Bridge-E processor PCSTATS is testing today in Gigabyte's GA-X79-UD5 motherboard, is just as finicky... it will tolerate a motherboard BCLK of about 105MHz or 106MHz before the PC refuses to boot. With the Sandy Bridge-E processor Intel also introduced a new BIOS setting called the 'Processor Base Clock (Gear Ratio)'. This setting is simply a way to up the BCLK multiplier on the order of 1.00x, 1.25x, 1.66x or 2.50x. The Gear Ratio overclocks the processor and memory bus speeds by the factor it's set to, yet leaves the 100MHz BCLK for the rest of the motherboard alone. Using this, enthusiasts can potentially overclock a 36x100MHz = 3.6GHz processor by changing the equation to 43x1.25x(100MHz) = 5.375GHz. Reality Check: You're going to have to work very hard to squeeze 5.4GHz from a 3.6GHz processor and be a fricken' master overclocker at that! In the BIOS of Gigabyte's GA-X79-UD5 motherboard you'll find a vast collection of CPU overclocking and voltage controls that will keep dedicated enthusiasts occupied for hours. Unfortunately, navigating through Gigabyte's UEFI BIOS gets tiring very quickly. This fancy BIOS is one of the major failings of the board, in PCSTATS opinion. The important overclocking settings are buried behind a relatively slow-to-display 3D BIOS splash screen. This reviewer really, really wishes Gigabyte would give overclockers who prefer to OC via traditional BIOS text menus an option to disable this fancy 3D BIOS splash screen from displaying. I'd rather use this semi-regular UEFI BIOS screen, to quickly and mouse-less-ly overclock!! Starting off with a default x36 multiplier, PCSTATS pushed the test Intel Core i7 3820 processor to x43 without any effort, resulting in an overclock from 3.6GHz to 4.3GHz. That was easy! The true test of motherboard used to be how high the front side bus speed could be pushed.... that's no longer the case as we know Sandy Bridge-E is limited to, at most, 106MHz motherboard BCLK. Attempts at 107MHz BLCK were not successful. The 'Processor Base Clock (Gear Ratio)' is a welcome addition to the overclockers tool box so PCSTATS set about seeing how far the CPU could be overclocked on the Gigabyte GA-X79-UD5 motherboard via this setting. To remove any potential obstacles, memory was set to run in DDR3-800 mode and the CPU multiplier dialed back from the default x36 multiplier, to x12. The BCLK Gear Ratio was increased from 1.00x to 1.25x without issue, however attempts at 1.66x and 2.50x proved futile. PCSTATS set the CPU multiplier back to the default x36 setting and tried again with the 1.25x BCLK Gear Ratio - the system failed to boot. After a few more attempts, the best we were able to manage without making voltage adjustments was a x35 multiplier and 1.25 BCLK Gear Ratio, or a maximum overclock to 4.375 GHz. With a boost to vCPU this board and processor combo should reasonably be able to reach x37 / 1.25x(100) so we'll leave that for you to try yourself. However, there are so many voltage adjustments available in the GA-X79-UD5 BIOS that it quickly gets a little overwhelming and we lost our patience with the GA-X79-UD5's slow BIOS user interface. To sum up, overclocking to 4.3GHz is dead easy. Just bump the CPU multiplier to x43. Overclocking beyond that will require a bit of skill. Without wading in the necessary territory of voltage adjustments PCSTATS squeezed 4.375GHz from the Sandy Bridge-E processor by using the 1.25x BCLK Gear Ratio... though with a little more time even greater speeds are easily on the horizon! Bottom line, the Gigabyte GA-X79-UD5 motherboard is a good overclocking platform.